Chopped salads are a beautiful way to show of summer’s terrific produce. Each ingredient is interesting to eat and taste, and together they combine to give you something even better. Position a rack in the center of the oven and heat the oven to 425ºF. Line a heavy-duty rimmed baking sheet with foil. Cut the peppers in half lengthwise and remove the stem, seed core, and ribs. Put the pepper halves on the baking sheet cut side down. Husk the corn and put the ears on the baking sheet. Drizzle the oil over the peppers and corn and rub it around to coat the pepper skins and corn kernels evenly. Sprinkle the corn with salt and pepper. Roast in the oven until the peppers are soft and slightly shriveled and browned and the corn kernels are lightly browned in a few spots, about 20 minutes (rotate the corn occasionally as it roasts). 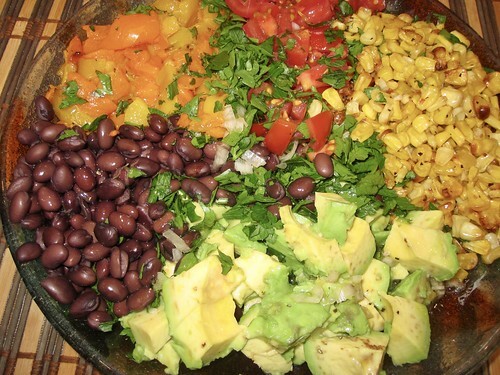 Artfully arrange the corn, tomatoes, peppers, jícama, avocado, and black beans in stripes or piles on a small platter or other wide, shallow serving dish. Sprinkle with the chopped cilantro. Serve the vinaigrette in a pitcher. Encourage guests to spoon elements of the salad onto their plates and drizzle on some of the vinaigrette. Or drizzle the vinaigrette over the salad platter just before serving. You can chop all the salad ingredients up to four hours ahead and store them, covered, in the fridge. Sent this to a Yael.